PF-501 is specifically developed for bridge coatings, coil coatings of architectural applications, automotive coatings, and marine coatings. It is composed of FEVE resin with excellent salty foggy resistant, weatherabiltiy, good antifouling and excellent corrosion resistant. 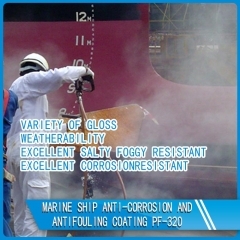 PF-320 is specifically developed for ship marine coatings. It is composed of CTFE/PTFE copolymer resin with excellent salty foggy resistant, outstanding weatherabiltiy, good antifouling, abrasion resistant and excellent corrosion resistant. 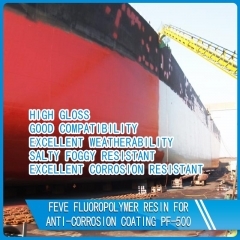 PF-500 is solvent-soluble FEVE fluoropolymers with excellent salty foggy resistant, weatherabiltiy, good antifouling and excellent corrosion resistant. It is used to make ultra-weatherable coatings for architectural, aerospace, automotive, and industrial maintenance markets. 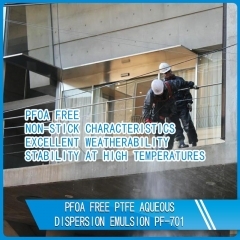 PF-701 is aqueous dispersions with (PFOA free) are generally used in the coating of fabrics and other substrates in various end use applications: Filtration, Architectural Roofing, Electronics, Semiconductor, Food Processing, Packaging and other end use components requiring a high performance fluoroplastic material. 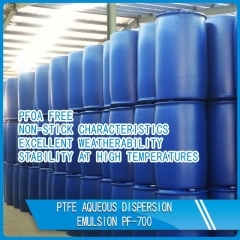 PF-700 is liquid dispersion products offer a practical method for PTFE coating or impregnating various materials and substrates to obtain properties typical of fluoroplastics such as, chemical resistance, low coefficient of friction, excellent dielectric and release characteristics and a wide service temperature spectrum.